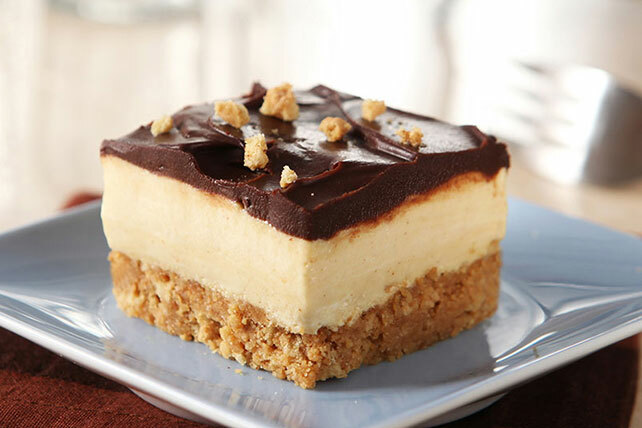 A cookie crust is topped with layers of creamy peanut butter and chocolate—elevating these squares from a candy store favorite to an elegant delight. Line 9-inch square pan with Reynolds Wrap® Aluminum Foil, with ends of foil extending over sides. Finely crush 24 cookies. Mix with butter; press onto bottom of prepared pan. Beat cream cheese and peanut butter in medium bowl with whisk until blended. Add milk and dry pudding mix; beat 2 min. Stir in 1 cup COOL WHIP; spoon over crust. Refrigerate until ready to use. Microwave remaining COOL WHIP and chocolate in microwaveable bowl on HIGH 1-1/2 to 2 min. or until chocolate is completely melted and mixture is well blended, stirring after each minute. Cool completely. Spread chocolate mixture over pudding layer in pan. Chop remaining cookie; sprinkle over chocolate mixture. Refrigerate 4 hours or until firm. Use foil handles to lift dessert from pan before cutting to serve. Save 40 calories and 3g of fat per serving by preparing with PHILADELPHIA Neufchatel Cheese, fat-free milk, 1 pkg. (1 oz.) JELL-O Vanilla Flavor Sugar Free Fat Free Instant Pudding and COOL WHIP LITE Whipped Topping.